If you've never served in the military, you're probably thinking that you don't know anyone serving overseas. For a while, I thought that was the case with me. Then I got a call from my parents one day. They'd bumped into a couple they knew, and the other couple mentioned that their son and I had served together in the Army Reserve many years ago. When my parents asked where he was now, they said, "Afghanistan, with the SAS". When we served together, I knew that he had been getting ready to attempt selection, but I went overseas and we lost touch. A chance encounter in the street brought home the notion that many of us are connected in some way to someone serving overseas. That was followed by the wife of a workmate being posted to Afghanistan for a few months in order to build facilities for the troops. Another bloke I met through Uni friends then took a posting with the UN in Sudan, in Darfur. He's just returned, about 15 kilos lighter. We've just found out that a bloke my partner went to school with is going back to Afghanistan for his second tour. There's another bloke I have become acquainted with who is still serving with the UN in a nasty troublespot. That's five, and I didn't have to look too hard. I've only worked on two degrees of separation, and I've found a handful of diggers who have served or are serving us in less than pleasant places. Every time I've heard of someone else going overseas or coming back, I've kicked myself for not sending them something - a note of support, a letter with news, or a care pack stuffed full of treats and small luxuries that are not often available where they are. A few months ago, I decided enough was enough - I'd get off my comfortable backside and actually do something. I'd put together a care pack, and I'd send it. Not long afterwards, I got a note back saying that the pack had been recieved, and the boys were gathering that night to share it around. For that's what mates do - we share what we have. We, who are living in the land of hot water and clean sheets and peace and security, should stop every now and then and give thanks and support to those that voluntarily serve in places where these things are absent.... for they serve to bring those things that we take for granted to those that do not have them. They serve to bring peace and security to where there is strife, to bring justice to where there is injustice, to provide light and clean water to where there is darkess and disease, and to bring hope to where there is despair. And please remember that dogs need a Chrissy too! Hey I was wanting to write letters to any aussie soldiers and I was wondering how to go about it. I am a full time uni student so I am unable to send a lot of care packages. Is there anyway I can write to them? 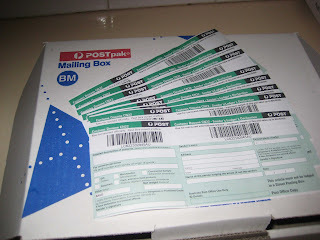 Send letters to the same address as the parcels. You could email using the address in the right side bar of this blog. Don't use the postcard address.